More bonus for using my referral links! Here are some currently available bonus offers. These offers, however, may change without advanced notice from the individual institution. For me to receive the $50 rewards from Zecco, both the myZecco account and trading account must be opened via the referral link and the trading account must be funded by at least $2,500. Rewards will be credited once the account is opened and funded. Free trades will be credited to the next 3 online trades (equity or option, market or limit, GTC or day order) that are made in your account. In order for me to receive the $50 bonus from TradeKing, the new account I refer to must have a deposit of at least $1,000 and one online trade must be executed. To receive the bonus, you must open a new account and fund it and make at least one investment. 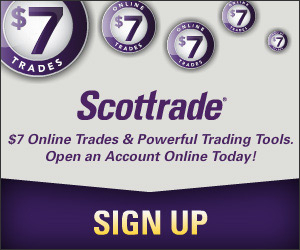 To receive the bonus, any new account I refer to must be funded and at least one trade must be executed. More referral bonus offers are available. If you open an ING Direct account with any of these referral links and make a deposit of at least $250, you will receive a $25 bonus and the referrer, at the same time, get $10. *Bonus offered by me, not the institution. You can get $55 with sharebuilder through the costco website, and a rebate on fees! I am aware of the Sharebuilder incentive, which is available to Costco customers only, and used to use the service. But later gave it up because the cost of using Sharebuilder is quite high. Instead I switched to Zecco. Awesome list. I just want to say that I’ve been with Firstrade for two years now and it has been nothing but awesome. They have great rates and awesome customer service. Not that many people have heard of them but trust me, give them a shot, they are well worth it! What are the Terms and conditions for opening the OptionsXpress account? Do they have a minimum? Any inactivity fees? Pretty cool, I run a business that is along the same lines. If anyone is interested in event tickets, you comparison shop and save a bit and I get a percent or two, but you pay no more than you would at the site we index (e.g. stubhub). Great list thanks for sharing. Good article and nice blog. Can someone has TradeKing account refer me to open an account? My email is lnassociates@live.com and I will provide my full name then. Thanks!